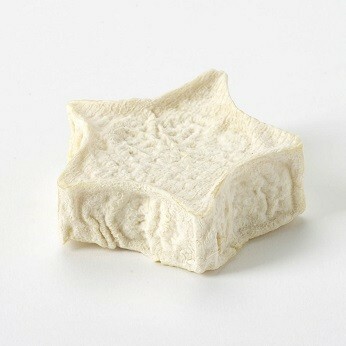 A pretty star shaped French Goats milk cheese, with a soft interior and fudgy consistency and mild flavour. Made in GAEC Fragnée in the Gâtine Poitou. GAEC stands for Groupement Agricole pour ‘Exploitation en Commun, which is a kind of cooperative.This superior farm cheese comes from the marshy Gatine area of Poitou. The area is also known for its apple orchards. Raising goats is a local tradition, and the inhabitants are proud of their cheese making. Etoile de Gatine is a pretty star shaped French Goats' milk cheese with a thin natural rind, a soft, fudge-like interior and a mild, clean and lactic flavour. If you prefer the distinctive delicate, fresh lactic goats flavour, it is best to eat these cheeses when they are relatively young, They become nuttier and more fudge-like with age.